Wi-Fi is becoming the connectivity method of choice, even for mission critical applications, such as voice, collaboration and patient monitoring devices. With an increasing number of diverse applications, along with mobile and IoT devices reliant on wireless access, networks must deliver high performance, reliability and security. The sixth-generation wireless standard, 802.11ax (Wi-Fi 6), promises to address issues related to the growing density and diversity of devices by increasing network capacity and improving user experiences. - How does 802.11ax differ from 802.11ac? - What use cases and applications is 802.11ax optimal for? - When will I start seeing advantages with 802.11ax? - Do I need to replace access switches to support 802.11ax APs? - If considering 802.11ax, do I need to replace all of my existing Wi-Fi infrastructure? Join us May 14th, 10am PDT and learn the top 3 ways your network can provide mobile users with a solid connection and unmatched experiences – all while improving your IT efficiencies.You will also see how you can get simplified management and control. This webinar includes a demonstration of Aruba Central, our Cloud network-management solution. Attend and you could qualify for a FREE Access Point and 90-day trial of Aruba Central. Is attracting new customers and increasing sales at the top of your business’s priority list for 2019? You’re not alone. In fact, roughly 70% of SMBs are investing or planning to invest over the next 1-2 years in technology to personalize and improve customer experience. Join us as Cherie Martin, Sr. Solutions Marketing Manager, and Josh Jaster, System Engineer, review two core features your network must have to gain insight to your customer base and take engagement to the next level. Attend and you could qualify for a FREE Access Point and a 90-day trial of Aruba's network cloud-management solution, Aruba Central. With the increasing demands on IT due to the explosion in connected devices, your time and money are more valuable than ever. Join us March 28th as Aruba welcomes our featured speaker, Brandon Butler of IDC, to discuss how you can simplify day-to-day network administration tasks and increase visibility and control to save you time and get the most out of your network. Attend and you could qualify to receive a free Aruba Instant access point and a 90-day trial of Aruba Central, our cloud managed networking solution. Is attracting new customers and increasing sales at the top of your business’s priority list for 2019? You’re not alone. In fact, roughly 70% of SMBs are investing or planning to invest over the next 1-2 years in technology to personalize and improve customer experience. Not only does the network play an important role in supporting new applications, the right network will have tools built-in to enable you to provide amazing customer experiences and keep the conversation going. Seventy percent of today’s midsize businesses are investing in technology to customize the user experience, improve customer satisfaction, build loyalty, and gain a competitive advantage. But the ability to deliver amazing user experiences is dependent on high-performance, reliable connectivity. It requires a business-class network. Learn about the Top 5 business-class features your network must have for you to automate and optimize the delivery of network services to drive your business success. A high-level discussion will be followed by a demo of Aruba Central, network management in the Cloud. 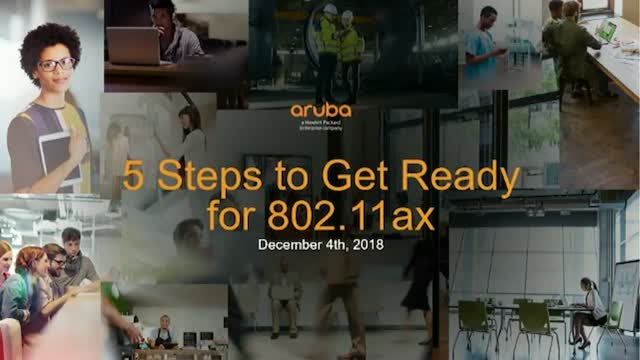 Attend and you could qualify to receive a free Aruba Instant access point and a 90-day trial to Aruba Central, our network management solution. How do your security practices compare with 3500+ other security professionals? Listen as the Ponemon Institute's Larry Ponemon and Aruba's Larry Lunetta discuss survey findings from the "Closing the IT Security Gap with Automation & AI in the Era of IoT" report. Did you know that over 50% of issues with network experience can be attributed to lack of pre-installation planning? There is a lot to consider, but the effort you put in up front saves time, money, and frustration over the life of your network. Join us as Cherie Martin, Network Solutions Manager, reviews the 9 critical steps you should take to ensure your network is smart and reliable. Security professionals from around the world were asked questions on the security gap and technologies and processes for staying a step ahead. With a focus on AI/ML, IoT, visibility, and automation, this webinar shares their responses. 86% of midsize companies agree that digital technologies are disrupting their industry. Your network has never been more critical. It is the onramp to your cloud applications. It is the way your mobile users connect, work and collaborate. And it is what enables amazing, memorable customer experiences. Choosing the right network solution has never been more important. Join us November 29th, 10am PST to learn about the latest trends and the Top 5 things your business network can’t live without. Join us to learn about the latest trends and the Top 5 things your business network can’t live without. Attend and you may qualify for a free Instant Access Point. With the arrival of digital workplaces comes added security threats. Your business will need integrated and automated security controls to help protect your data from malware and unauthorized users. Including wireless intrusion detection and prevention, your network can be safeguarded from wireless threats, rogue access points and clients. As a trusted brand that provides next generation network solutions, Aruba helps keep business applications and data safe. Qualified attendees with receive a free Aruba Instant Access Point and a 90-day trial license of Aruba Central networking cloud management solution. Join us on October 16th, 10am PST to learn about the Top 5 business-class features your network must have for you to automate and optimize the delivery of network services to drive your business success. Your business site is changing, workplaces are transforming. We’re going from cubes and square footage, to any location, with mobile devices, for a wide variety of applications. That’s why it’s essential to choose access points and network management tools to meet the demands of your guests, employees and IT team. Join us September 13th, 10am PST to learn about the latest trends and the Top 5 things your business network can’t live without. The mobile-first classroom lets everyone thrive when they use Wi-Fi enabled devices and apps that create a richer learning experience. Join Dan Rivera, Education Solutions Manager at Aruba, a Hewlett Packard Enterprise company and learn how to support your K-12 Digital Learning initiatives with an Aruba Mobile-First environment. Rethink enterprise networking for mobility and cloud. Aruba, a Hewlett Packard Enterprise company, is a leading provider of next-generation networking solutions for enterprises of all sizes worldwide. Learn about networking solutions that provide secure access from anywhere. Hear from industry experts and Aruba ecosystem partners about key topics on network performance, BYOD deployments, and cloud-based technologies.